Ed Sheeran was the big winner at the 2018 Billboard Music Awards on a night where politics featured just as heavily as the music. Host Kelly Clarkson opened the ceremony with a tearful plea for a “moment of action” in the wake of a school shooting in Texas while Janet Jackson, who was honoured with the Icon Award, backed the women who “have made it clear we will no longer be controlled, manipulated or abused”. The annual awards show, which celebrates artists’ performances on the Billboard charts, took place three days after the deaths of 10 people at Santa Fe High School, which reignited the fierce debate around gun control in the United States. Clarkson, who had to compose herself on several occasions during her speech, said: “Once again we are grieving for more kids that have died for just absolutely no reason at all. And tonight they wanted me to say that, obviously we’re going to pray for the victims and pray for their families, but they also wanted me to do a moment of silence. During the Las Vegas show, singer-songwriter Shawn Mendes performed his new single Youth alongside rising star Khalid and the pair invited members of the Marjory Stoneman Douglas High School choir from Parkland, Florida, on stage with them. The school was the scene of a mass shooting earlier this year. Following Clarkson’s speech, the ceremony got under way with a performance from Ariana Grande, who took to the stage two days before the first anniversary of the Manchester Arena bombing. Grande had just finished a show at the Manchester Arena on May 22 2017 when suicide bomber Salman Abedi detonated an explosive device in the foyer, killing 22 people and injuring hundreds more. At the Billboard Music Awards, she performed an emotional rendition of No Tears Left To Cry, her first single since the atrocity. Jackson, 52, was awarded the Icon Award and used her acceptance speech to praise women who have “made it clear that we will no longer be controlled, manipulated or abused”. She said: “I am deeply humbled and grateful for this award. I feel that for all the challenges, all of our challenges, we live at a glorious moment in history. “It’s a moment when at long last women have made it clear that we will no longer be controlled, manipulated or abused. 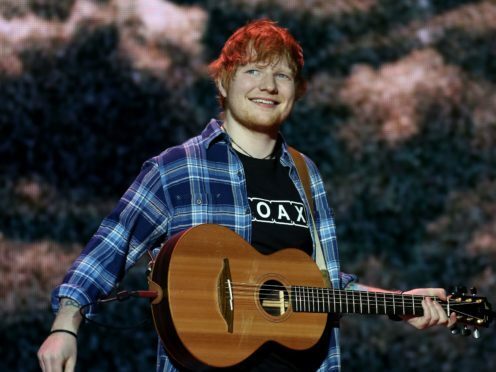 Sheeran won the main award of the night, being recognised as Top Artist, beating off competition from Drake and Kendrick Lamar. He also won Top Radio Songs Artist, Top Song Sales Artist and Top Hot 100 Artist. Other winners include Top Female Artist Taylor Swift and Camila Cabello, who scooped the Billboard Chart Achievement Award. Before the ceremony kicked off, Lamar was leading the way with six wins from the non-televised categories. Clarkson and Grande were among several artists to perform on the night, including Sheeran, Khalid, Mendes, Jennifer Lopez, John Legend, Cabello, Dua Lipa and Salt-N-Pepa with En Vogue.